How did a jazz musician based in The Netherlands become so immersed in flamenco, a form of folk music and dance from Spain's Andalusia region? The answer becomes self-evident when one reads in Bernard van Rossum's bio that he was born and raised in Spain by an English mother and Dutch father. 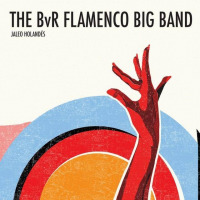 Flamenco has thus been an integral part of van Rossum's musical awareness since he was old enough to appreciate what music is, a fact that becomes readily apparent on his inaugural big-band CD, Jaleo Holandes, in which the traditional rhythms and harmonies of flamenco are skillfully blended with the contemporary jazz idiom to produce an album that satisfies on both levels. As it turns out, van Rossum took up residence in The Netherlands as recently as 2009 to study at the Amsterdam Conservatory, having studied music earlier at Barcelona's Taller de Musics and at the University of North Texas in Denton. 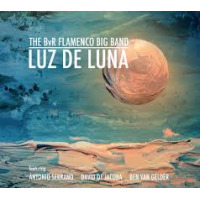 After gigging with smaller groups including his own Catalan ensemble, Lunar Project, van Rossum formed the BvR Flamenco Big Band, which was awarded a well-earned first prize at the eighteenth annual Meerjam International Big Band Competition in 2014. The BvR is a full-size seventeen-piece ensemble, enhanced by a quartet of flamenco artists whose mandate is to provide vocal and percussive support. Perhaps it doesn't take someone from Spain to transplant flamenco into a jazz format, but it surely doesn't hurt. Van Rossum clearly has a firm grasp of each genre, as a result of which his engaging compositions and arrangements (he wrote and scored every number) are awash in perception, authenticity and shifting tempos. He also knows flamenco is about vivacity and color, and splashes them liberally throughout. It is interesting to note, however, that neither flamenco nor jazz predominates; in fact, each one splendidly reinforces the other, giving rise to interaction and improvisation of the highest order. While soloists aren't named, that is most likely van Rossum on tenor ("Acuarela") and soprano sax ("Camino Sin Ti," "El Viajero," the last with pianist Xavi Torres and a superb but unidentified trombonist). There are fine alto sax solos on "A New Being" and "El Caprichoso Pincel," and as van Rossum isn't listed as playing alto, the presumption is that either Jasper van Damme and / or Miguel Ortega is responsible. The flamenco artists are indispensable, enhancing the rhythmic pulse while adding simpatico vocals by Maria Marin ("El Ultimo Tango," "Camino Sin Ti") and Pablo MArtinez ("El Caprichoso Pincel"). Even so, it is the ensemble as a unit that shines brightest, proving that flamenco and jazz can not only coexist but fashion music that is as pleasing to the ear as it is true to its nature and provenance. Much of the credit for that belongs to van Rossum, a musician whose aptitude and frame of mind are uncommonly broad and inclusive. Track Listing: A New Being; El Ultimo Tango; El Viajero; Camino Sin Ti; El Caprichoso Pincel; Acuarela. Personnel: Bernard van Rossum: leader, composer, arranger, lyricist, tenor, soprano sax; Gerhard Ornig: trumpet; Bruno Calvo: trumpet; Natanael Ramos: trumpet; Evgeniy Bondarev: trumpet; Jasper van Damme: alto sax, flute, alto flute; Miguel Ortega: alto sax, clarinet; Dani Torres: tenor sax; Fernando Sanchez: tenor sax; Bruno van der Haegen: baritone sax, bass clarinet; Oliver Emitt: trombone; Lorenzo Lorenzoni: trombone; Alisa Klein: trombone; Haraldur Prastarson: trombone; Xavi Torres: piano; Marco Zenini: bass; Joan Terol: drums. Flamenco Artists – Maria Marin: voice, palmas; Pablo Martinez: voice, palmas, percussion, trombone; Jeff “el Finito” Heijne: Spanish guitar; Miguel Hiroshi: percussion, cajon.